Seems like my wife and kids can never leave well enough alone when it comes to pets. The newest ones: two degus. 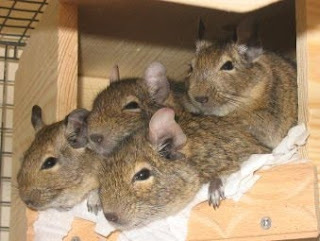 Degus look like rats but are really closely related to chinchillas -- of which we have two! Always good to win a Shark tournament even if the top prize won't make you rich. Shark players are tough! So ... I felt like garbage and cashed in all three smallish tournaments, final tabled them all, and even won one. I run goot when I feel bad? Waaaay back when, I used to delight in going to Opening Day when the baseball season began. So ... when I saw that the 2009-2010 WSOP Circuit was going to start at the Horseshoe Hammond, it seemed like a natural for me to go to the opening event -- a $345 NL tournament on October 16. Harrah's allowed a three-hour preregistration the night before. I heard that 500-600 people chose that option. I got to the casino about two hours before the opening hand. I was surprised to see that there were 200-300 people in line ahead of me. It took 75 minutes for me to get to the front of the line. After I registered, I saw at least another 200-300 still waiting in line. Last year's opening tournament attracted over 1,100 entrants. It would be interesting to see how Harrah's would handle this large crowd. The tournament began on time at noon. Most of the tables were set up in The Venue -- the small second floor concert hall in the complex. My table was in the regular poker room on the main floor. Starting chip stack: 10,000. Levels: 45 minutes! This was one heck of a structure for an inexpensive tournament. No matter what, I expected to get in a lot of poker for my money. The worst part of the tournament was that Harrah's allowed alternates to come in for several hours. I believe that over 300 alternates came in, bringing the total up to 1,412. First place paid almost $80,000 -- not bad for a $345 buy in! My table had solid players. Too solid, in fact. We kept passing about 40,000 chips back and forth for several hours. I got some big hands the first hour or so (A-A, K-K), but couldn't drum up much action. However, I limped in with 2-2 and hit my set on the flop. The guy to my left didn't believe my check raise, so he reraised me. Two hearts on the flop kept me from flat calling, so I reraised his reraise. He reluctantly folded. Too bad he only had top pair, top kicker, or I might have busted him. I took a big hit when I flopped top two in an almost family pot. There was a realistic straight possibility on the board, so I didn't want to push as hard as I would have liked. I got rid of everyone but one seemingly tight player who apparently chased a flush to the river -- and hit it. We kept seeing the average stack size going up as players were felted, but we just kept passing the chips back and forth. After 6+ hours we had only lost two players. Soon we were moved upstairs. The last two hours I played were very frustrating. Sensing the need to make a move since my M kept dipping lower, I kept seeing rag-rag, paint-rag, and rag-rag. Our table was finally broken and I was moved to a new table where half the people had decent stacks. A guy to my left was calling almost all the all-ins, so I knew I couldn't bluff. I was hoping to go all in before the dinner break and either double up or go home, but the cards did not come. And I wasn't even hungry. Right after the break, I had A-9sooted and pushed. One guy thought long and hard, but folded. I stayed alive. Another orbit or two later I was praying for a good hand. I was dealt A-Jos. A raise came from under the gun, and I pushed all in. Everyone else folded. The original raiser called -- putting almost half his stack at risk -- with Q-10hearts. Of course, you know how the story ends. The flop brought a Queen and two hearts. He faded the few outs on the flop and river. It was over. Just before 9:00 pm. They announced that a new Horseshoe Circuit record had been set with the 1400+ players. They also gave players interesting news -- that they should be prepared to play until 3 or 4 am to complete the day. Looks like letting all those alternates in so late screwed up the expected timetable. Although I ended the tournament sooner than I would have liked, working with 10,000 chips and 45-minute blinds was great. The banter at the table picked up after a few hours and was pleasant. I had a good time and can't wait for my next chance to get in a quality tournament. If I could swing it time-wise -- the next circuit destination at Horseshoe Southern Indiana? Yesterday, October 19, was a bittersweet day for me indeed. On the bright side, my mother celebrated her 84th birthday. Within the past several years, my mom has had open heart surgery, knee replacements, and lord knows how many trips to doctors, hospitals, and rehab centers. Still, she carries on. Ever since my father passed away she has said that she is ready to go. However, good family genes are confounding the situation. All her brothers and sisters (with the exception of a brother who died in an auto accident) lived long lives. With my mom's medical history, I would not be shocked if she passed away at any time. With her family history, however, I would also not be surprised to see her live to celebrate many more birthdays. The down side of yesterday was that a friend from work was buried. Tom was a member of the maintenance crew and always stopped to bs with me about softball. Yeah -- two softball junkies with broken-down bodies reliving their past glories. It didn't dawn on me until yesterday that Tom was the only person outside of my family who came out to a softball game just to see me play. I was horrified to realize at the end of the day that I had missed the brief visitation hour before his funeral. However, I am reminded of Wolfsheim's quote from The Great Gatsby: "We need to show our friendship for a man when he is alive and not after he is dead." Miss you, man. Show those dudes up in heaven that the stroke can still be there long after the legs have gone. Today I played in one of the Online Forum Challenge tournaments. It was funny that even though there were 786 runners, fellow poker blogger Smokkee was seated at my table at the start. I only remember us going at it one hand. I decided to play pretty tight since there is so much donkey play in these tournaments. The best I could do today, however, was 68th place. 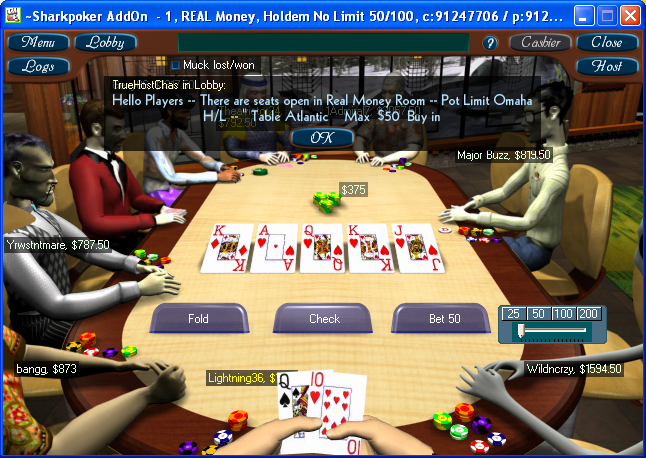 I was in the money, but missed all the bonuses and was not able to score any points for CardsChat. Hard to believe I actually won one of these some time ago. Saturday was reserved for my first trip to a Rockford Charitable Games event in East Peoria. In Illinois, we have very few poker rooms. They are located in the riverboat casinos and are not exactly the greatest. Our only other legal options for playing b&m poker are organizations like Rockford Charitable Games. Charitable organizations contract with them to hold poker tournaments as fundraisers. The event was held in a local VFW hall -- a common place for charity tournaments. The tables were not the best, but were functional. The dealers were all very good, however. Having only one person taking money for the opening tournament, however, made for a long registration line. 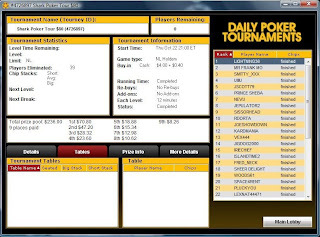 I played in the first tournament -- a $25 buy-in with a $5 add-on for the dealers. My table had people playing pretty tight, so I loosened up and won a few pots in the beginning. However, I spewed chasing a few pots and eventually went out when I flopped top pair but was out kicked. The cash games were soft -- not surprising. I ended up a little bit ahead, but nearly what I had hoped. Several times when I flopped sets or had the nuts or near nuts I had no takers. The highlight of the day, however, was getting to meet another poker blogger, the lovely gadzooks64 . I let her know that the event would be in our neighborhood, and she came out for a few hours in the afternoon. We didn't get to play together, however, but it was still nice meeting one of our fraternity. I have been disappointed that Illinois Charitable Games, which used to be my main b&m "home game," has apparently gone out of business. Unfortunately, the Rockford group does not normally travel this far south. If they take over the territory, however, I think they will find that central Illinois is full of decent poker players -- and a fair share of people who like to play regardless of their skill level. What time is the Bears game? Are the Hawks playing tonight? It is October. In many areas of the United States, baseball fans are salivating at the aspect of post-season play, which will begin tomorrow. Fans in the Detroit and Minneapolis areas have an exciting one-game playoff. The winner advances. The loser goes home. For Chicago baseball fans, the season realistically ended several weeks ago. How depressing. Although many Chicago fans line up in either the Cubs or the White Sox camps, I am one of the rare breed who supports both teams. Doubly depressing. Last year at this time, the Chicago White Sox won a one-game playoff against the Minnesota Twins to join the big boys in post-season play. 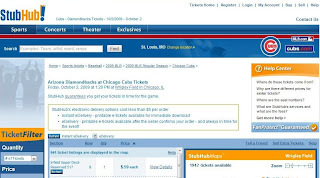 The Chicago Cubs were the National League favorite. The potential of a Cubs-Sox World Series? Out of this world. Unfortunately, real life intruded, as the Sox were not able to get past the first round (not exactly a shocker) and the Cubs, true to form, continued their now 100+ years streak of futility. Hopes were high for 2009. The Sox would be playing in the weakest division in baseball and the Cubs made some moves to put some left-handed bats in the line-up. The results: pure crap. The Sox were maddenly inconsistant, showing stretches of great play and stretches of play more befitting a Class AA team. The Cubs? What a disaster, from signing Milton Bradley to getting rid of Mark DeRosa (who then ended up with the Cardinals -- yuck). Despite a huge payroll, the Cubs were terrible. They had lots of excuses (to see how a good team deals with adversity, check out the Anaheim Angels) but little in the way of performance. The toughest part? The main enemies of the teams (the Twins and the Cards) showed that things can be done in a different way. The Cards did everything right this season, from acquiring great players (DeRosa, Holliday, Smoltz, etc) to playing excellent fundamental baseball. They came from behind countless times in the late innings. They have one of the best managers in baseball. They are easy to despise. They do things the right way. The Twins? Well, they seemed as hapless as the White Sox, but knew when to turn it on late in the season. They even depended on the Sox to beat the Tigers in two out of three games to tie with the Tigers at the end of the season. Even if they do not win game 163, they showed much more heart than the Sox when it really counted. What to do for next year? Sweet Lou says that he will be back next year, but the Cubbies would be best to make a hard run at Tony LaRussa. The Cubs need to make a decision about Milton Bradley and get a decent player at second base. They have a bloated payroll but at least should finally have the ownership situation rectified. Perhaps the Ricketts family will have some new ideas. The payroll is killing them, though. The White Sox have interesting questions. With the addition of Jake Peavy, the Sox now have one of the best rotations in baseball (Burhle, Danks, Floyd, and Peavy). Will they keep Bobby Jenks as closer? What will they do about Alexei Ramierez? Is Gordon Beckham for real? What to do about the "old guys" -- Konerko and Dye? Who should really be playing in the outfield? The Sox, in my opinion, have the opportunity to be one of the better teams in baseball next year -- if good decisions and moves are made. For now, however, those of us who root for Chicago baseball teams will have to be content to watch non-Chicago playoff games. There is always next year. Thank goodness the Bears and the Blackhawks have legitimate shots at championships this year. It helps ease the pain in October.